Hello there Wizards and Pirates alike! It is I, Blaze Shadowhorn. As many of you may have noticed, this past year I was inactive as I had retired from the Kingsisle gaming community and moved on to focus on school and other things. The thought of coming back has been in the back of my mind for quite some time. Sadly, I knew what my priorities were and decided to focus on my schooling and real life. A little over a week ago, I was looking through my laptop photos looking for a photo to post on my friends Facebook for his birthday. I came across something that brought back grand memories. In a sub-folder hidden away, I found a recording my mom made of when I co-hosted the first episode of my retired Podcast – Spiral Live alongside co-host Nicholas Lionrider. My, did it bring back memories. The next day, my mom and I were talking and she told me the following, “Do what you want in life. You will only find happiness if you truly are passionate about something.” This got me thinking. Wizard101 was something that I had played since 5th grade. If you didn’t know, I’m currently in 11th. Nearly 7 years of my life I have spent playing both Wizard101 and Pirate101 and I realized that this is one of the only things that has always given me unconditional happiness. If I was ever down, I did a few quests and caught up with many of you. I was telling my friend last week that I have truly made the best friends throughout my years of playing Wizard101 and Pirate101. Throughout the past year, I kept in touch with some of you and would check up on the news once in a blue moon but I’ve missed being a part of the community and I have realized that this is what I need to do. 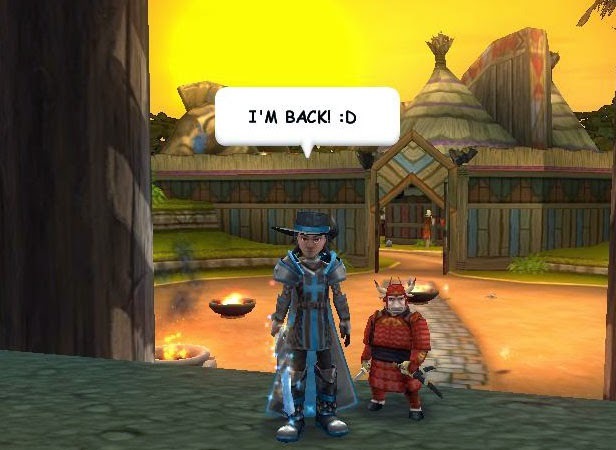 Blogging, questing, and just hanging with all of you makes me happy and I so I decided to make a return to the community to be with all of you. You may be wondering what is new or going to change on the blog. Well I’ve got a ton of great ideas so keep reading to see what’s new! For starters, I want to continue posting a few times throughout the week. My goal is to post as often as possible and just like the past, the posts will differ between Wizard101, Wizard101 UK, and Pirate101. I also want to bring back something I used to do – Blog of the Month. This would be an adapted version of when I used to post about new blogs to check out. Being a Blog of the Month, you would have a short interview with me discussing your blog and all it offers. In addition, you would also get an exclusive Blog of the Month badge, just for you that you can show off on your blog. For those of you veteran ToTS readers, remember my old Fourth of July parties, get-together and quests events and hang outs? Well this will all be returning! I want to help bring us all together for tons of new events and parties that I’m sure you will all love. In addition, I am in the process of working with Christina Icedreamer to bring lots of new amazing events to the community to help bring us closer together. Furthermore, have you guys noticed how many new blogs and fansites there are for both Wizard101 and Pirate101? It’s crazy! I was talking to Swordroll the other day about how I want to eventually get around to meeting all of you and get to know you. Not to mention all the new Twizards and Twirates and community members in general. There are so many new blogs and people who I want to meet. I’ve started meeting some of you but I can’t wait to meet the rest of you as time comes! There is so much more I want to tell you all, but if I said it all now, there would be no surprises in the future! With that being said, I can’t wait to get re-adjusted to the community and spend yet another fabulous year with you all. Lastly, I just wanted to say thank you to all of you who gave me a warm welcome when I came back. It truly meant the world to me and all of you made me know for a fact that I made the right choice in coming back. If you haven’t done so yet, I had to re-create my Twitter so please feel free to follow me at @BlazeShadowhorn for all the upcoming news and such! I hope you’ve all been well and I can’t wait to see you in the Spiral! hey, I'm new to your site, what's this for exactly?